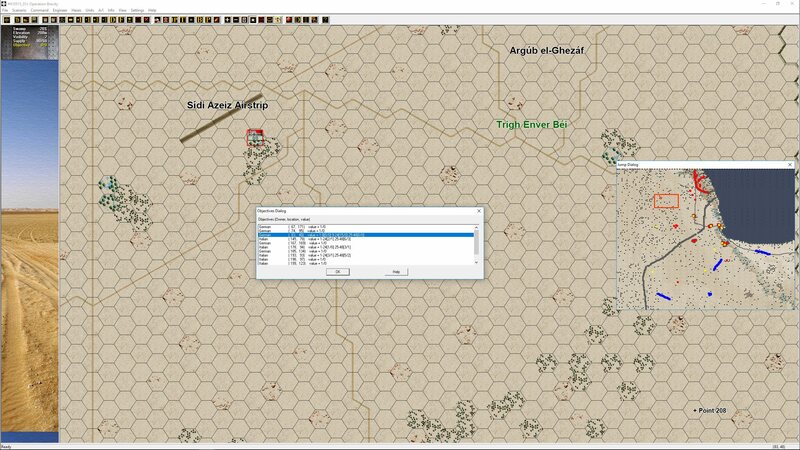 We mentioned Panzer Battles 3 taking precedence in our last blog post. Many of you have been asking for an update on that title, so here it is. 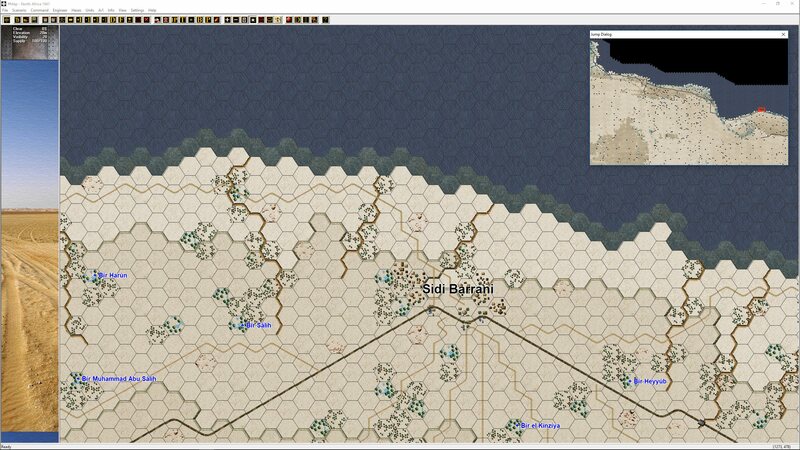 We have scenarios done already for Sonnenblume, Tobruk, Brevity, Crete and Crusader. We are yet to start on Battleaxe and Compass will be dependent on time left at the end of the project. 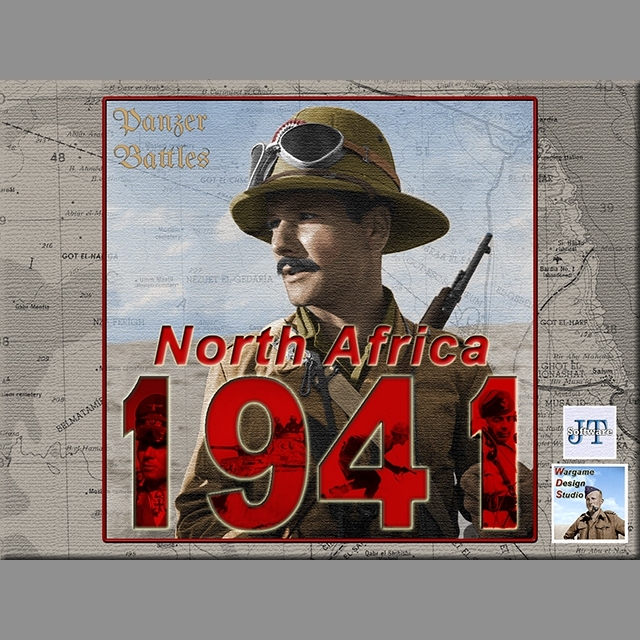 Covering the first year of the war in North Africa is sufficient for a single title and is probably a good introduction to the desert. The engagements in 1941 were marked by low unit density, large engagement areas and little in the way of fixed defences other than at Tobruk. It was only during 1942 that the extensive minefields and other entrenchments played a part at battles like Gazala or El Alamein. Crete was included for a change of pace to the desert and is a perfectly scaled battle for the Panzer Battles system. 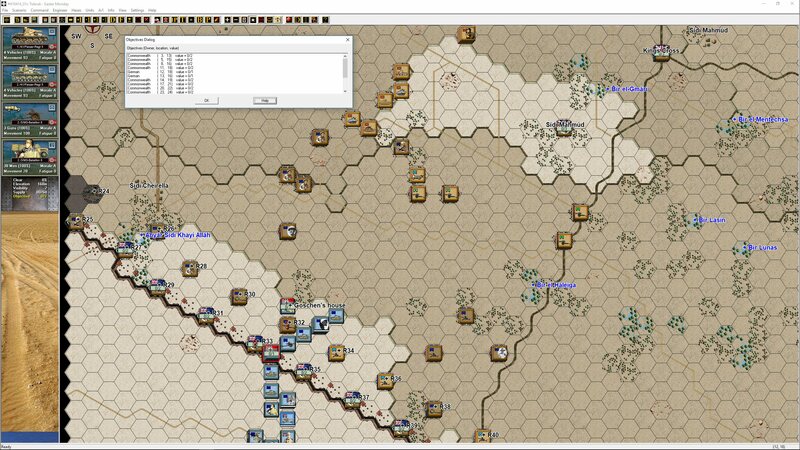 In our initial playing, both Crete and the desert scenarios play quite differently to both Normandy & Kursk and to date seem to be a good facsimile of the histories and experiences that we have read. We have in the past said that it takes us between 18 months to two years to complete a title. With the two-year mark passed last December that is obviously not the case here. 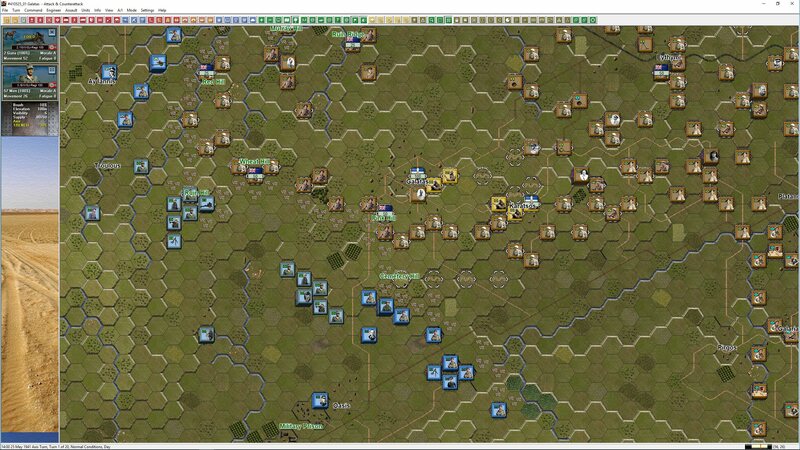 The main reason for the delay has been the additional work required in 2016 & 2017 to get both Wargame Design Studio up and running (just web and blogs take up significant time) as well as the Gold updates for Panzer Campaigns and the coming refresh of all the Civil War Battle titles. Throw in the Panzer Battles Demo and upgrade of both Normandy and Kursk to the new Wargame Design Studio standard and there has been a lot to distract us from North Africa. The good news is that we’re back focused on this title (and everything else) and the aim is to get the game out this year. That said, it will be done when it is done. 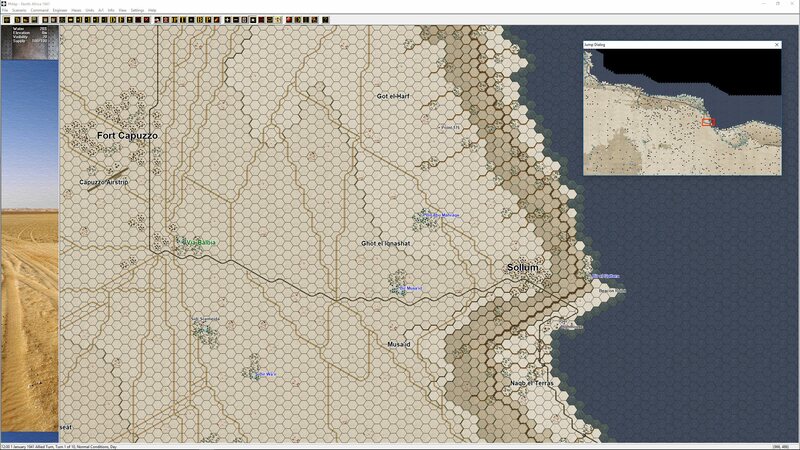 Here are some shots from the master map in North Africa. The map stretches from just east of Derna to just west of Mersa Matruh. 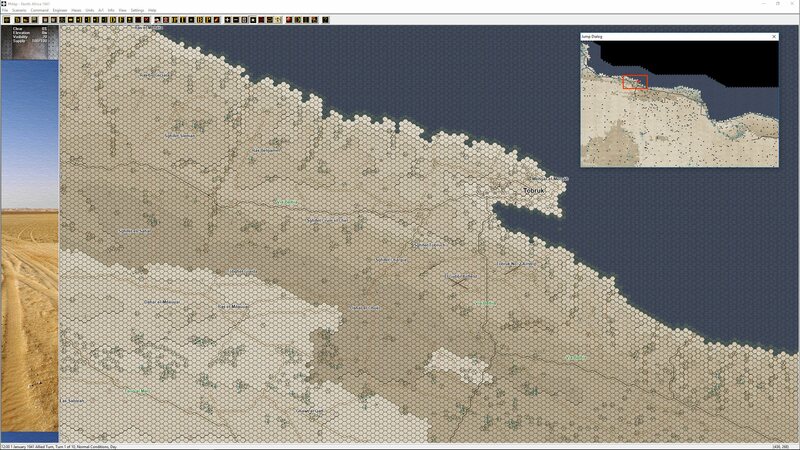 The map covers a massive 1,234,000 hexes. 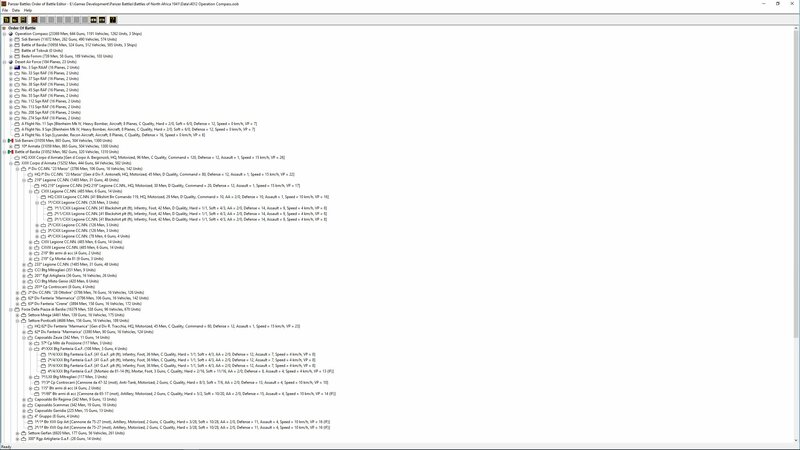 In addition to the North Africa maps, there are four maps covering the German Fallschirmjaeger drops in Greece and Crete and a further 3 – 4 maps covering the area west of Derna for scenarios during Operation Compass (Beda Fomm) and Operation Sonneblume (Mersa Brega, Mechili and possibly a few others). Every one of these maps have been hand created using period 250,000 to 1 maps of the applicable areas. With any new title there is always a push to add or improve things. Two areas that I can share that have had further work on is the Computer AI and Victory Points. 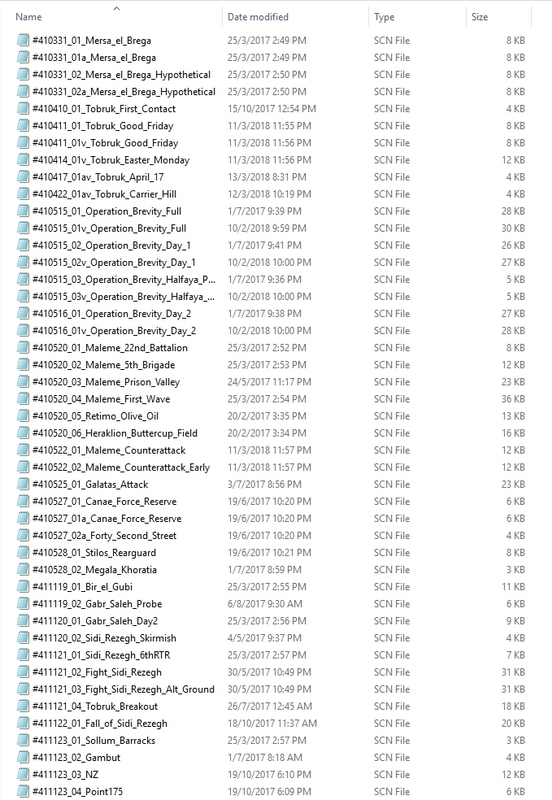 Tiller’s AI has always been a mixed bag and Berto our programmer has just started to dip his toes in here. Berto is not an AI specialist by any means but he has already started to make some improvements to some of the more bizarre behaviour. 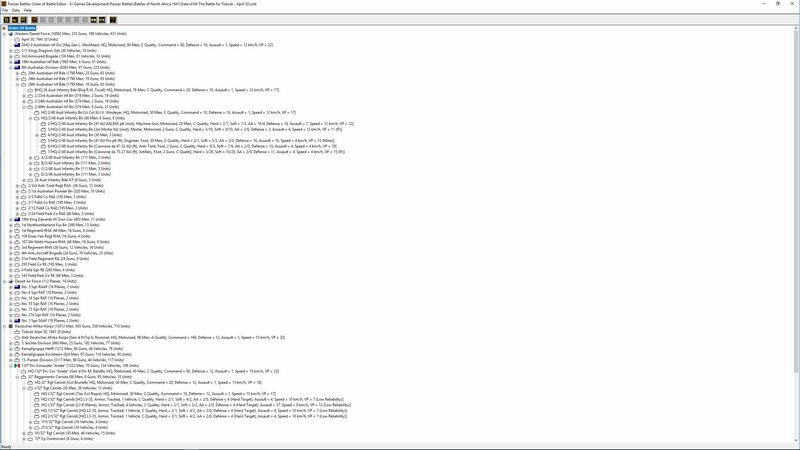 The scenario editor comes with several default scripts that help the scenario designer to determine appropriate behaviours. These are now working closer to what we would expect. That said there will never be a substitute for a human opponent and where necessary we’ve including both vs AI and head to head versions of scenarios. The bigger change is around Victory Points. John Tillers games have traditionally worked off an end of game reckoning of points for losses and victory locations held. This, in many cases has resulted in the only relevant turn being the last turn. Hold the victory location for nine out of ten turns and you get no recognition for what may have been a tenacious defence. It’s only he who holds the location on the last turn that matters. 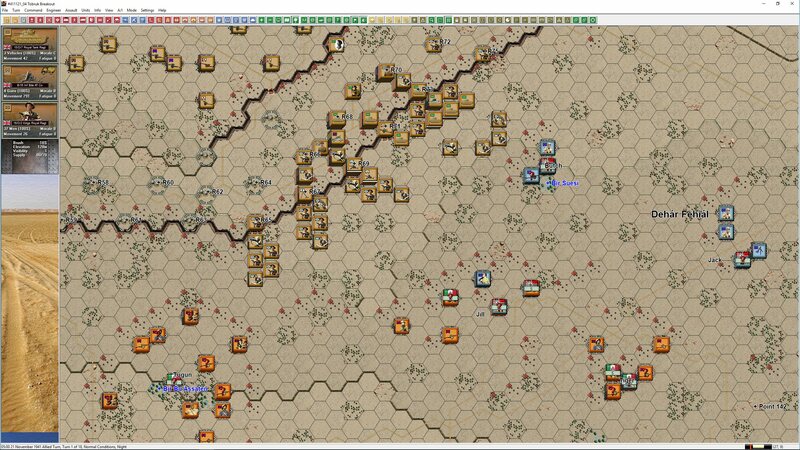 As we looked at the fluid nature of the desert engagements we realised that the end of game calculation was rarely going to work. In fact, a change to victory calculation came to the fore with Normandy – specifically the Bluecoat scenario where we wanted a mechanism to reward the Germans for holding forward but couldn’t do it without giving the British easy victory points. Since Normandy was released we have gone backwards and forwards on potential options. # points at a location. Where # is some positive integer. For example: 50. This functions exactly like traditional objective hexes: The occupying side, first side only, accrues these points immediately (i.e., the Victory Dialog notes this immediately and doesn’t wait until the end of the turn). These accruals are one time only (i.e., don’t continue to pile up from turn to turn). t-t[#] t-t[#] t-t[#] … Where # is some positive integer, for example 5; and t-t is a range of turns, for example, 1-8. You can have a single t-t[#], in which case the first t should be 1, the second t the scenario maximum turn. Or you can have a sequence of t-t[#], where the turn ranges must be ascending, with no gaps or overlaps. The turn ranges need not be uniform, i.e., the number of turns in each range may vary. Note that the varying objective values need not ascend, or descend. Unlike the t-t turn specs, the objective values can be anything you want (so long as they are non-negative). The objective values need not be according to any formula. They can rise, fall, go to zero, etc. They can be completely arbitrary. If it’s not clear, the t-t[#]… objective hexes thus function much like traditional single-number objective hexes – with one time awarding of points – except the points value can vary by turn. This option is included for games that end early where a player chooses to resign and for a probable future sudden death option, with forced early game termination where a VP threshold is reached. #/# points at a location. Where the # are positive integers, where the first # applies to the Allied side, while the second # applies to the Axis side. For example: 3/5. 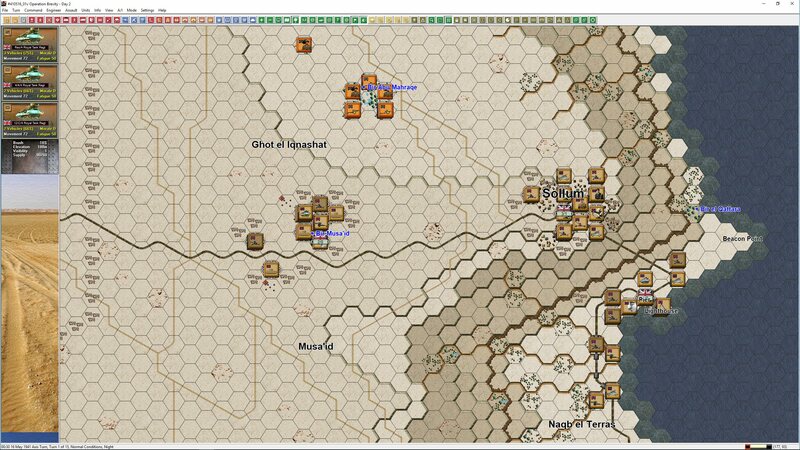 This is a new type of objective value, where accruals add up each turn, and may accrue to either the Allies or the Axis. In the example 3/5, for a ten-turn scenario, if the Allies hold the objective for the first 4 turns, while the Axis seizes and holds the objective for the remainder of the game, the net effect of this objective hex is 3 + 3 + 3 + 3 – 5 – 5 – 5 – 5 – 5 – 5 = -18 assuming the Allies are the first side. One or the other of the #/# may be zero, but not both. 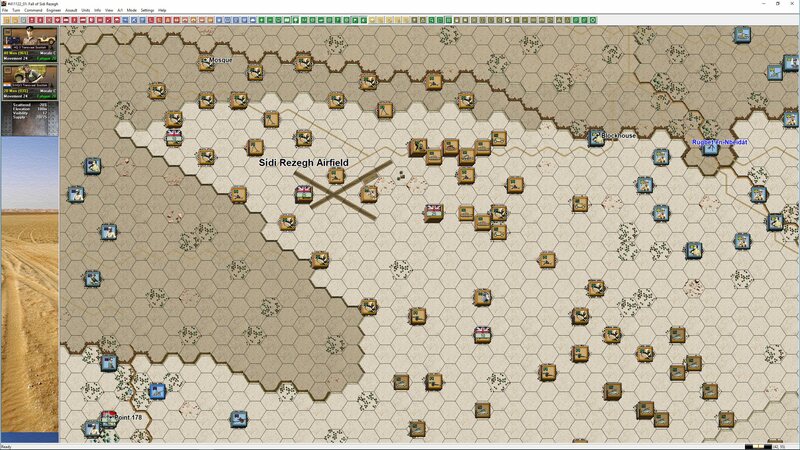 So, for an objective hex value 4/0 the Allies would accrue 4 additional points for every turn they hold the objective, while if the Axis hold that objective, they gain nothing. t-t[#/#] … Like the preceding type, but varies by turn segment. For the turn specs, the same rules apply (ascending, no gaps, no overlaps, last t in the sequence is the scenario file turn). This says, for turns 1-3, neither side accrues points for holding the objective. For turns 4-6, the Axis (only) accrues 5 points each turn for holding the objective. For turns 7-10, both sides accrue 5 points for each turn they hold the objective. Our rationale for introducing the new victory point options is that with some scenarios (particularly longer ones), we’re seeing that players have little incentive to play historically. In many cases holding objectives on the last turn is the only key requirement. Moving to a per turn or variable basis shifts that emphasis. Having the ability to have a different value for each side will allow better balancing as well as different importance for each side of the various locations. Attacking players will now be motivated to be more daring and drive to take objectives that are higher value for them, despite the risk of isolation or counterattack. Defenders will be motivated to try and hold high value (to them) forward positions where each extra turn will net them a high value rather than just surrendering it to preserve troops and to hold the victory hexes that are higher value to all in the rear. An additional benefit is that campaign scenarios can have different objective weightings based upon the situation picked by each player – this will really open up the replay ability. 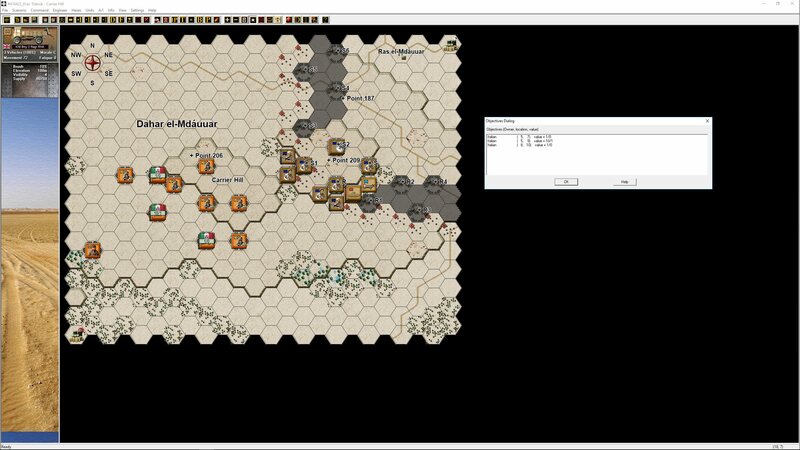 The campaign designer can vary victory points in each outcome based on the situation each player chooses. For example, a player who chooses a scenario that defends the left side of a map will have left side VP’s weighted higher for the time he holds those victory locations. The options are endless and it will allow us to reward behaviour that is more in keeping with the scenario’s intent. Here are a few shots from the Crusader scenarios. It should be obvious from the shots shown that the maps are big and the unit densities are generally low. 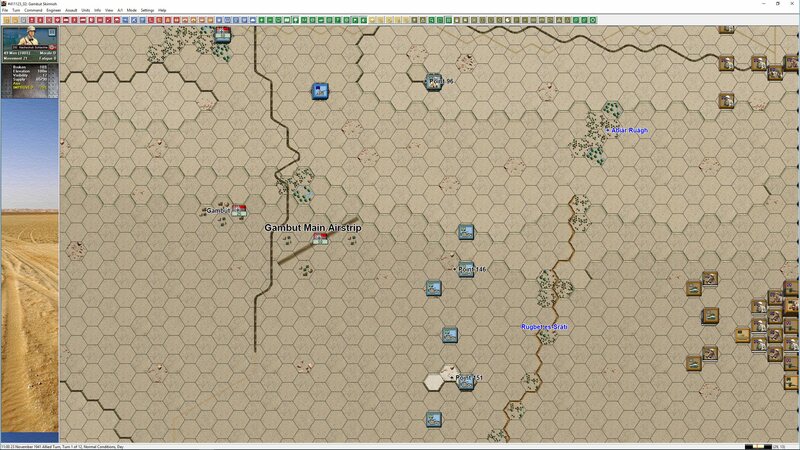 We are very happy with the way the scenarios are playing and there is a distinctly maneuver feel to the desert engagements. We have a lot of work done on this title, but a lot to do. For example, the new Variable victory points is a new addition and we must go back and look at existing scenarios and decide whether there is value in refitting them. In many cases we’re leaving a ‘traditional’ version and a new variable version in game. I hope this update is welcomed by all, and we’re sorry for the wait but we believe the end product will be worth it. Looking forward very much to this new Panzer Battles Game. Another update! Thanks. Looking forward to this game. Thanks. We know, we are migrating to a new server and have run into issues. We’re trying to sort that out now. Can barely wait for this! Looks like it’ll be great. 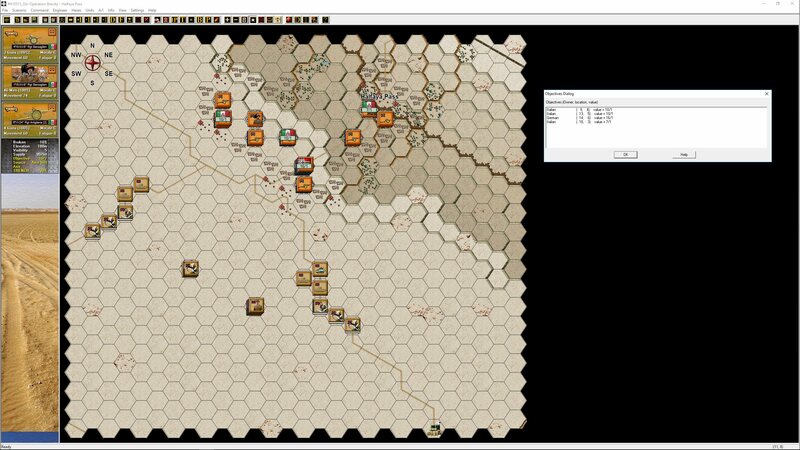 Have to admit, I was disappointed with Matrix’ recent Desert War ’40-’42 (and I generally Love Matrix games). Praying this one fills the still-remaining void for great, WW II, N. Africa warfare. Haven’t really found anything to tide me over until this one’s released. This looks fantastic. I’m very pleased with Normandy and the inclusion of Crete/Merkur makes this installment a must buy for me. Love the work you all are doing. love the new victory rules……….hoping the game is released soon. The gold updates had me replaying a lot of PzC scenarios, hours of enjoyment re-invested in an old favorite. Making retirement so much more fun. Can’t get enough of it. But I’m really eager to get my hands on this PzB3 title. I check often. Any day now I think. Have patience, it will come. I really want this next title, bad. And PzB4! And what about PzB5! Let alone PzB6 and PzB7, something I’m really looking forward to. Every day, the same routine… did I get the email on PzB3 release… oh well, let me go stare at the blog again.